One more for the class of 1985. Well, sort of. He's counted as an 85er, but he was actually available as a Sears exclusive in time for Christmas of '84. Tollbooth's love for building started when he was six years old. His parents gave him a construction set for Christmas and he wore it out before he was seven. Every year his sets got bigger and more complex until he outgrew them all. He received his Masters in engineering from MIT, but needed a bigger challenge than what civilian life could offer. He joined the US Army and graduated at the top of his class from the Sapper Leader Course at the Combat Engineer School at Fort Leonard Wood, Missouri. Then he expressly asked to sign up for and become a member of the elite GI Joe Team. Tollbooth performs a variety of combat engineering duties such as laying or clearing minefields and building bridges. He is proficient in demolitions, field defenses and general construction, as well as road and airfield fabrication and repair. He's got the tools to blast a pass through solid rock, or lay down a four-lane blacktop if needed. His teammates are constantly amazed at his ability to build a bridge out of whatever's there. Tollbooth's only new part is his head, which was designed by Boss Fight Studios, a group of ex-Hasbro employees who banded together after the last round of layoffs. It's a great head, much more intense than the dopey, Fred Flintstone-lookin' original, but he's still got his trademark orange hard hat, and it's still cocked at a rakish angle. The head rests on Sgt. Stone's torso, which was probably chosen because it's a button-up shirt that's slightly rumpled at the collar - the old toy had his shirt unbuttoned to below his chest, and his dogtags were hanging out. Short of sculpting a new torso for this toy, there was no way they were going to manage that. The choice to use Tiger Force Flint's arms is weird, since the Footloose arms still have the rolled sleeves, but a better sculpt and articulation. Then you've got the combination of Shipwreck's upper legs and Night Fox's shins, which makes him very short. The lower legs are so much shorter than the thighs that he looks like he has dwarfism. At 3⅞" tall, he's the second shortest G3 figure there is (beaten only by Tunnel Rat). On the plus side, that will make it easier for him to fit into vintage vehicles. There's a lot of wiggle in the hips, too, like the metal bar that holds them isn't sitting securely. Rather than a plain brown vest, Tollbooth is wearing Night Fox's webgear. It helps him pass the squint test: dark boots and gloves, brown pants, dark vest, green shirt, orange hat. Sure, a lot of the work is done by the hat, but it's still easy to tell this is an update of the old toy. One really neat new feature, though? 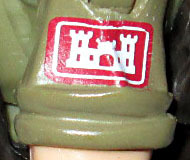 He's got the Corps Castle (the symbol of the US Army Corps of Engineers) on his right sleeve. Tollbooth's real name is Chuck X. Goren, a reference to famous bridge player Charles Goren - this is because he originally came with the Toss 'n Cross bridge layer. Obviously that wasn't going to happen today, but the accessories we do get are nice. 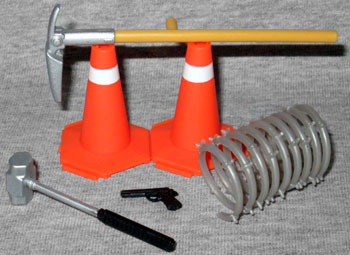 He's got a pistol in the holster on his hip, a sledgehammer, a roll of concertina wire, a mattock, and two orange traffic cones. So basically, a whole bunch of stuff that an engineer would need to use in his day-to-day work. Admit it: Tollbooth is a very "behind the scenes" member of the Joe team; He's not going to be the guy out on the front lines personally battling Cobra, but he's definitely going to be providing invaluable support for the guys who are. He only appeared in five episodes of the Real American Hero cartoon, and was stone silent in two of them. He only ever had four lines of spoken dialogue, which is the fewest of any speaking character who also had a toy. Poor guy. He was just "the guy who drives the bridge layer," and now, even that's been taken away from him. This is still a decent release, if you're not going to be bothered by his stumpy legs.